I’ve always been a supporter of looking back at previous teirs and figuring out what we can learn form that. (Not too dissimilar from what George Santayana said in his work The Life of Reason, “Those who cannot remember the past are condemned to repeat it.”) With that said, this post is similarly inspired by Vixsin’s post “Resto Shaman Lessons from Tier 12″. In this post, lets go over each of the seven bosses in Firelands (Normal and Heroic) and recap some of the mechanics and how our toolkit worked well (or not) for the fight. Knowing our weaknesses and strengths will be critical in knowing how to approach Dragon Soul in 4.3. Firelands was a very tricky tier for us priests, but ultimately we fared very well. – A lot of this tier incorporated grouping up, which allowed for ease of use with our PW: Barriers, HW: Sanctuaries, and POH Range. – Divine Aegis buffed by 30% with the introduction of 100% Critical Heal bonuses. – Gear itemization had both Haste and Mastery “tracks”. – Multiple fights with +damage modifiers which lend well to Atonement healing. – Holy’s primary regen stat providing 0 throughput (Spirit) while Disc’s stat (int) scales exceptionally well causing Holy throughput to lag behind. – Divine Hymn’s mana cost to output being outweighed by pure POH spam. Atonement worked exceptionally well on this fight, especially if you were tasked to heal the Spark Tank. Since the Sparks took increased amounts of damage the longer they stayed alive, your Smite:Healing ratios stayed in step and allowed for you to keep mana levels healthy during the burn phase. Rhyo had several changes to him through the tier, the most substantial being his knock-up when he stomped being removed; this dramatically affected his difficulty since it didnt interrupt casting and allowed burn-phase positioning to be much more forgiving. Rhyo was a bit of a pain week to week as he was littered with bugs the first several weeks, managing sharp turns was a learning curve (and buggy); but after a couple of repeat HM kills he became one of the easier farm bosses for us. Holy Priests did well given the AOE nature of the damage in much of the fight, as well as the ability to use COH on the move when running from Lava Lines. Disc, as previously mentioned,were exceptionally great Spark Tank healers and grouping up to PW: Barrier Phase 2 Stomps was very helpful. The mantra for this fight is DON’T STAND IN THE FIRE! Between the Brushfires and the Worms breathing fire and the Flame Tornados there is a lot of fire to dodge on this fight. Luckily, as a healer you should have been prioritized to have at least one feather on this fight, enabling you to be able to cast while moving. The amount of damage going out on this fight should be minimal on non-tanks (provided people are avoiding fire and interrupting Feiroblast), but substantial on the tanks. As a priest being able to alternate using your cooldown (PS/GS) and the tank’s cooldown with the Hatchling’s Tantrum was an important part of managing this fight. If you were Archangel spec’d timing your wings with Tantrum was another tool at your disposal. Since damaging her when she crashes restored mana, being inefficient in the first phase was doable, and more than a few times I used Strength of Soul/Flash Heal/PWS spam to protect the tanks. With the ability to cast while moving during the Tornado phase, you could use Divine Hymn while dodging to top of those who might be low (or bad at Tornado-Frogger). When Alysrazor recharges and starts doing her AOE, Barrier and HW: Sanctuary should be used. I really enjoyed this fight as a priest and felt that our toolkit was built to excel here. A Disc priests dream. There is a reason that all the top parses on this fight are done by disc priests: Strength of Soul and Power Word: Shield. Both on Normal and Heroic modes, this fight was built for Discipline. Most strategies relied heavily on 2 (on 25 man)Disc Priests stacking their Spark buffs, and then utilizing PW:S (a 0 overheal spell) and Strength of Soul (via regular Heal spam) to protect the tank from the massive amounts of damage Baleroc could deal. From a design standpoint it really was an interesting fight. At it’s core the fight was meant to have Baleroc’s damage ramp up as the fight went along, but included a mechanic for healers to increase their output to stay in step. On Heroic this fight was one of the more difficult fights of the tier. (especially pre-nerf given his swing timer and buff/debuff timers on the healers). The reason why I like this fight so much (aside from BIG NUMBERS) is that the fight is exceptionally dynamic (on Heroic). Throughout the fight the Countdown mechanic could dramatically affect the next 60 seconds of the fight– either by Tormenting your next soak target, or Tormenting a Healer. This forced guilds to adapt on the fly and manage these changes very quickly. If guilds failed to do so, Torment could spread quickly through the raid, a shard soaker could be missed, or too many healers could have had their output reduced and the fight would be over. Adapt and survive. Now, I totally agree that Disc is a favored on this fight… however, Holy isn’t worthless. Our first kill had a Holy Priest in raid. Guardian Spirit, (unlike PS) works against Decimation Blades, as such using that can help keep your tank alive through D.Blades. It is important to state that our first kill’s Holy Priest ranked 2nd in the world— not that he isn’t a good player, but the population of Holy Priests on that fight is very small on that fight. This fight is arguably the most different when transitioning Normal to Heroic of all the fights in this tier. With the introduction of Concentration it dramatically affected most strategies– particularly ones that involved soaking Scorpion Form cleaves. As a priest you could use Concentration 2 different ways… 1. Since the healers were buffed, and nearly all the non-tank damage was avoidable, many strategies ran this fight with as little as 3 healers. 2. Any fight with a +damage modifier is a fight that Atonement Priests love. In this example, Atonement heals double dipped. (+damage to Smite and then +healing to Atonement… win/win!). Additionally, with a Disc priest in the raid, you could Power Infuse 100% concentration targets and let them blow up Staghelm. I have mixed emotions about this fight. After downing him on Heroic mode, looking back at the number of pulls we did both pre and post-nerf; you have to ask yourself “Was he overtuned?”. 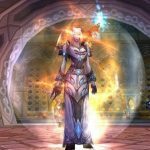 Consider this, 4.3 is literally just around the corner and as of 10/31/11 only 87 guilds have killed HM Rag on 25-Man in the US. Regardless if you think he is overtuned or not, HM Rag is one of the most difficult bosses we have ever faced in the game– and as masochistic as this sounds; I really enjoyed him. Healers really had a difficult time on this fight especially considering the fact that guilds were pretty much forced to run 3-5 healers. Disc Priests struggled as raid healers on this fight given the spread out nature of the fight, the RNG aspect of burst damage during Son’s phases as well as the lulls in damage that provided time to top off your raid, making most Divine Aegis shields useless. Disc tank healing, however, was very beneficial. It allowed for high uptime of Inspiration on the tanks, as well as additional Tank Cooldowns for several times during the fight. Not to mention the importance of timing Power Infusions on key players to push past critical checkpoints in the phase transitions – yeah, 1 meteor! Holy, on the other hand, did much better as a raid healer on this fight. Higher healing mobility allowed for quick COH snaps during Seed Kiting runs, as well as the opportune HW: Sanctuary to assist in topping the raid off after a Seed explosion. As far as expectations in 4.3; the throughput issues that Holy had throughout T12 seem to be addressed with the improvement of Divine Hymn via the new talent, Heavenly Voice and with the improvements (and bug fixes FIXES) to the Holy Word spells. With my time on the PTR in dungeons, these 2 changes have notably increased Holy’s output. Until we get more PTR Raid Testing time (and see it in a 25 man raid), we need to just ‘hurry up and wait’ to see how much this increase will augment Holy’s toolkit— I, for one, am very hopeful that these changes will provide some much needed throughput in a 25 man setting. Disc in 4.3 won’t see much change at all. Disc will continue to be a very versatile healer– both as a Raid Healer and a potent Tank Healer. The trick for Disc Tank Healing is to continue to educate Healing Leads and Guild Management the importance, viability, and arguable need for a Disc Tank Healer in 25 Man Raids. So many guilds still favor Paladins, which I attribute to tier after tier and patch after patch where pallies are the only ‘real’ tank healing option. (In fact, our first HM Ragnaros kill had zero Holy Paladins). I would be completely remiss not to acknowledge one of the biggest follies from T12: the number of healers that were required from fight to fight. This was a huge error in Blizzards court. With fights ranging from 7 to 3 healers in a 25 man setting, it made creating your roster a literal nightmare. 4.3 better damn well have a more consistent healing requirement. I urge folks to take a gander at Beru’s post on this issue, as frankly, she hit the nail on the head and I couldn’t have said it better. How are you all handling the current content and what do you expect in 4.3? What has this tier taught you? What have you learned to become a better healer? I am, however, going to end this post with a personal favor to ask of everyone. 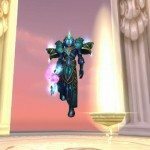 With Tales now re-opened, help me get the word out: let your fellow priests and healers know that I’m back!